On April 17, Father George visited lower elementary grades to share his rare Easter egg collection with the young students. The eggs were beautifully designed, decorated, and some were even intricately carved. There was a hand-painted egg with a dragon from China, nesting eggs from Russia, and a few from Guatemala and other countries. 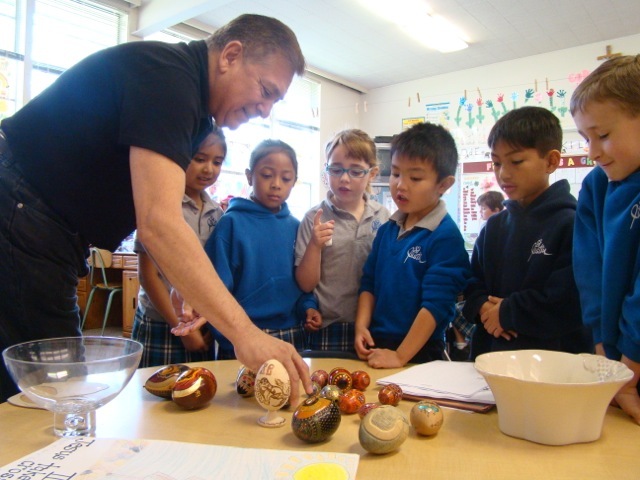 Father George talked to the children about the meaning of the egg during Easter – about new beginnings in our daily lives. The children had an enjoyable time touching and looking at the unique eggs up-close.